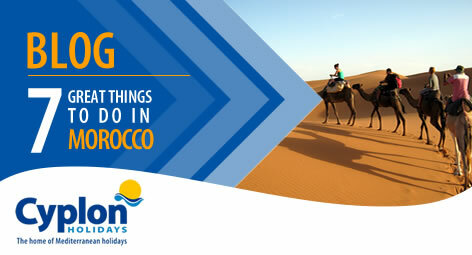 Summary: great excursions in Morocco. Morocco is an amazing country that offers visitors endless experiences that provide insight in to this fantastic country’s culture and landscape. Souks are a major feature in Moroccan life and no visitor should visit this country without getting lost in one of its souks which can be found in most towns and cities. Moroccan souks are like mazes made up of individual passageways selling a huge variety of crafts, spices and everyday objects. Even if you are not planning to buy anything the colours and energy that the souks give off will draw you in. Don’t worry about getting lost, it’s all part of the fun! Morocco’s Atlantic Coast is a great place to take to the sea and try out some water sports. Long beaches of golden sands run all the way down the coast and the warm waters provide great conditions. Morocco is particularly popular for surfing and even if you are a beginner surfer there are plenty of organisations that offer lessons. Tea is very important in Morocco and the people of Morocco are well known for their hospitality, always offering guests a drink of mint tea made with fresh local herbs. Why not make like the locals and find a café to sit out in a square or souk and enjoy sipping away whilst watching the hustle and bustle of life in front of you. With international food available all over the world nowadays you may well have already had a tagine outside of Morocco. However, none will be quite as delicious as one made locally, having been slowly cooked in its clay pot all day with spices freshly sourced from nearby souks. This twelve-acre garden is a peaceful place to escape the hustle and bustle of Marrakech. Restored by Yves Saint Laurent the gardens are magnificently colourful with many rare species of plant. The gardens have an incredibly calming atmosphere and are also a great place to escape the midday heat. The stunning Atlas Mountain range can be reached in a day trip from Marrakech. The mountains offer all kinds of activities including horse riding, mountain biking and hiking. They are also a great place to witness the daily life of the Berber people who still occupy villages scattered around the mountains. As well as mountains, Morocco has desert sands and is a wonderful place to take a camel ride. Many companies offer excursions with an overnight stay enabling you to camp out in the desert’s unique environment where you can listen to traditional music and gaze at the stars all night long. Fri, 29th Aug 2014 / Article read 5953 times.